The Blue Gem turquoise mine is located near Battle Mountain, Nevada, scene of the bestselling book THE GLASS CASTLE by Jeannette Walls. The mine has not produced turquoise for over 25 years, and experts agree that the best specimens were mined from the late 1960s through the late 1970s. 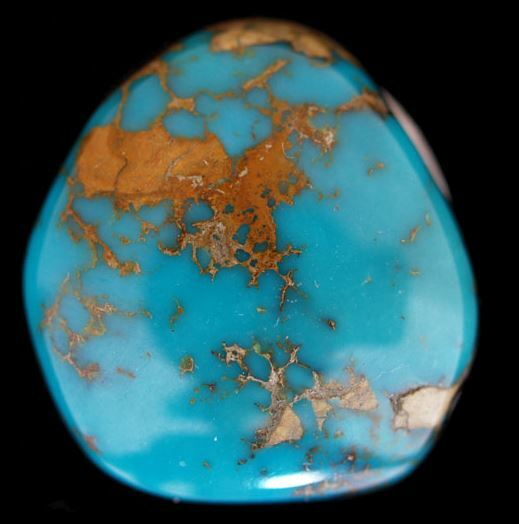 This particular turquoise stone was cut and polished by the DePriest family from Manassa, Colorado shortly after 1976. The astonishing blue/green color of this stone, and its unique hardness and shine is one of the best stones to emerge from the Blue Gem mine. Blue Gem turquoise is a rare, valuable and historic American treasure. Quality Blue Gem Turquoise has a wide range of color. Because Blue Gem turquoise is very hard, it takes a high polish, making the color even more intense. It is striking and full of wonder. The mine opened about 1934 and continued into the 1970’s. Unlike most turquoise mines, most of the turquoise found there was of gem-quality. Today the Blue Gem mine sits in the middle of a huge mining operation. The emphasis is on precious metals, and the extraction of turquoise is considered more of a hindrance in the mining process rather than an asset. Even the ever-popular “Dump Diving” for turquoise through the overburden is not tolerated. Insurance factors, equipment hazards, high explosives and safety issues keep Blue Gem turquoise unavailable to the world. Unless, of course, you are the fortunate person who purchases this heirloom stone. It’s sort of like buying a shiny miracle.